Posted with permission from Dispensational Publishing House. One of the wonderful privileges that I have in my role with Dispensational Publishing House is the opportunity to interact with great Bible teachers, pastors and other authors. One such man is Dr. Robert Lightner. I have heard of him for many years, as he was a seminary professor to my own teachers, and I was also acquainted with the wealth of his written materials. We share a common heritage in the General Association of Regular Baptist Churches. I am so grateful for the faithful testimony of this man over many decades. And I am pleased to announce that Dispensational Publishing House will be publishing two new books from him: Christ: His Church, His Cross, His Crown and Heaven and Hell. How blessed we are to introduce him to you here, first, in this interview article, where we are able to profit from Dr. Lightner’s observations regarding dispensational theology across the decades of his ministry. 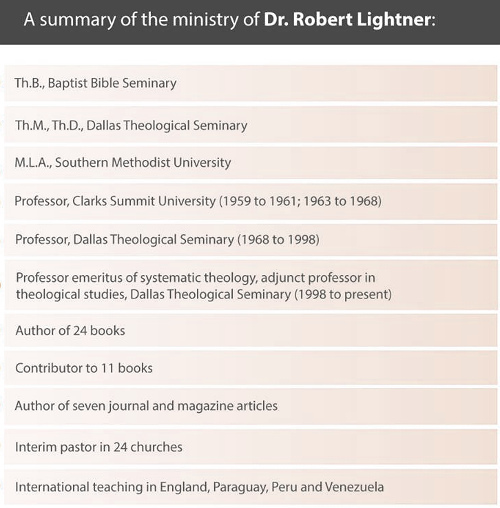 Dr. Robert Lightner has been a fixture at Dallas Theological Seminary for nearly 50 years. Doubtless like many of his own students, he traces his understanding of dispensational theology to some very influential professors. Lightner first went to Dallas as a student in 1955, and he had some pretty good teachers there, as well. Lightner had the opportunity to serve as Dr. Charles Ryrie’s grader, and realizes what a deep influence that experience had upon him. “I would highly recommend Ryrie’s Dispensationalism book and encourage any student to read that book carefully. Of course, I am a little prejudiced, because he is a favorite of mine. Ryrie’s approach to educating is very, very foundational and basic, so I would recommend that,” he said. Over his more than six decades in higher theological education, Lightner has certainly seen lots of practical changes. In that spirit, he gave the bad news first. But is there some good news? Lightner definitely sees that as well. And, for Lightner, dispensationalism is truly about some very big ideas. Those big ideas also lead us to some exalted goals. Paul J. Scharf, M.Div., is the editor in chief of Dispensational Publishing House. He has experience as a writer, pastor and Bible teacher and lives near Columbus, WI. Contact him at paul@dispensationalpublishing.com. I greatly appreciate this article. I had Dr. Lightner at BBS (now Clarks Summit Univ.). I always like his courses and his books. Just hearing his name brings back a lot of good memories. Thanks to SharperIron for rerunning this article, and thanks Richard for sharing those good memories! We are working on two new books from Dr. Lightner. He is a great gift to the church.